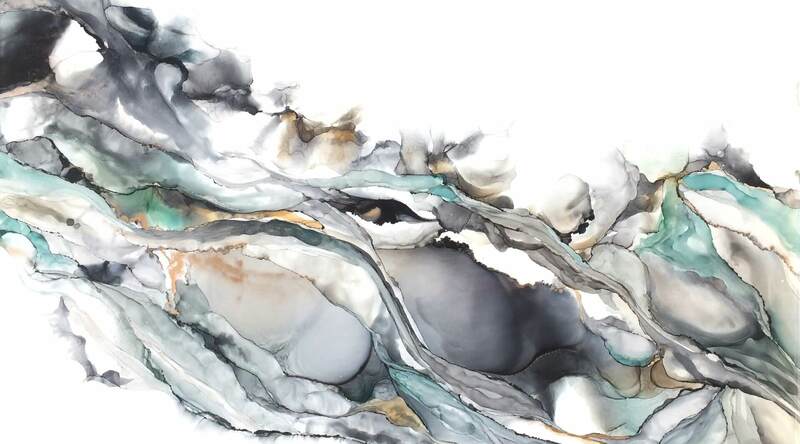 Grace Kube is a Tasmanian based self-taught abstract artist, inspired by the Tasmanian wilderness, weather and geology. Grace is discovering ways in which working with the uncontrollable nature of fluidity can be the perfect medium to explore her inspirations. The completion of the creation of ‘Diagenesis’ signifies a milestone development in my identification as an artist. It was a moment where I realised that all paths (including working as a geologist) had led me to this point and all experiences influence my art. Diagenesis, a general term in geology referring to a group of changes that sediments undergo before lithification (turn to rock). ‘Diagenesis’ represents a change for me, a shift in the way I view myself. A shift in the way I accept decisions made and my pursuit of happiness. The movement and overlapping paths of the ink representing life. I hope that this piece can evoke a sense of acceptance and accomplish that your own journey is perfect for you.